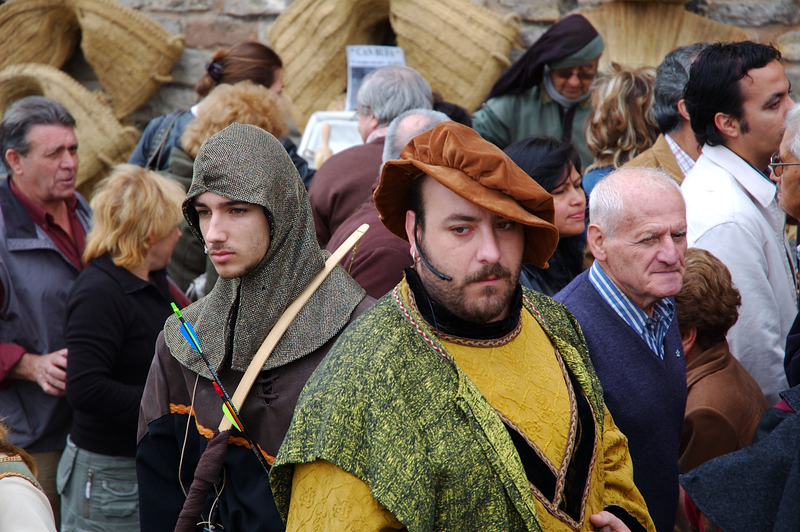 Súria Medieval Crafts Fair took place this weekend in Poble Vell, the old part of this fortress town. The origins of the fortified villa can be traced back to the XVIIth century when it started to grow around the castle already built in the Xth century. There was a need to protect the salt route along the Cardener river nearby (salt was exploited in the Cardona Valley since Roman times)and also because this land marked the limits between Christians and Saracens. Other important events in the history of Súria have been the cruel Carlist wars in the XIXth c. or the exploitation of potash deposits in the area discovered in 1912. So far so good...As an introduction after yesterday's vegetable stall I show you some folks in town dressing in medieval costumes. An archer and a lord perhaps? I specially like the staring into space of both of them. I was really lucky. From here, congratulations to the artists and citizens of Súria, an attractive Catalan town. Great costumes/apparel and facial expressions. they look miserable! but great shot! can I ask what Suria means in Catalan (Or Spanish)? In Malay, it means the ray of the sun. Thanks Kate for the coment. Haha Edwin I think you are right they look miserable as they were not acting but somewhat tired or worried. I only know it probably comes from Sorisa in Latin. Surisa, name (based on to smile, L. risor-oris; It. sorridere; Fr. Souire) SORISA (SVRISA) or SORI SA. Capital letters are Etruscan. Great composition - especially like the fact that the guy is wearing a bluetooth headset. Wherever you travel, you cannot escape those damned phones! Keen observation Kevin. Artist were supposed to participate in a play on stage and were all carrying headsets. Not too medieval! Very interesting scene!medieval mixed modern. Great capture, great scene, great characters. Good laugh about the mobile phone too!